I love the flavors in this recipe. Homemade, whole wheat pasta, smoked salmon, tarragon, parsley, and lots of sweet butter. 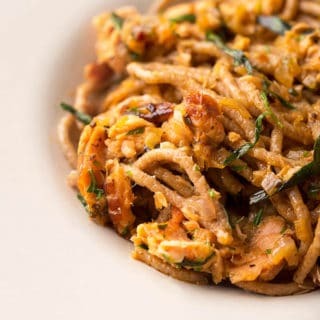 This is a salmon pasta for the Pacific Northwest, for Salmon Nation. Big flavors, hearty, unpretentious. No tweezers, fancy plating or hard-to-find ingredients here. I make my own smoked salmon and my own whole wheat pasta, the latter from wheat I grow in my own backyard. (I admit I am a little crazy.) This recipe will be better with homemade salmon and pasta, but store-bought will do. Note that I use hot-smoked salmon, which flakes, not cold-smoked, which will not. I chose whole wheat pasta, actually bigoli, which I made with an old school Italian torchio, because it has heft, and the homemade spaghetti is rougher in texture than machine made; this roughness allows each strand of pasta to hold onto more sauce. I urge you to use whole wheat, spelt or some other heartier, darker pasta here. It matters. As for the salmon, in this case I used a chum salmon I smoked over alder and glazed with birch syrup. Chum (a/k/a keta or dog salmon) are excellent candidates for smoking, but any species will do. As would any kind of trout. Smoked lake trout would be ideal. New Englanders should use smoked mackerel or bluefish, Southerners smoked king mackerel or wahoo. The rest is pretty simple. and this recipe comes together in less than 30 minutes if you have everything ready. 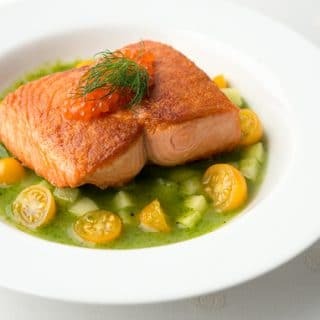 You can find nearly 100 recipes for salmon and trout right here on Hunter Angler Gardener Cook! 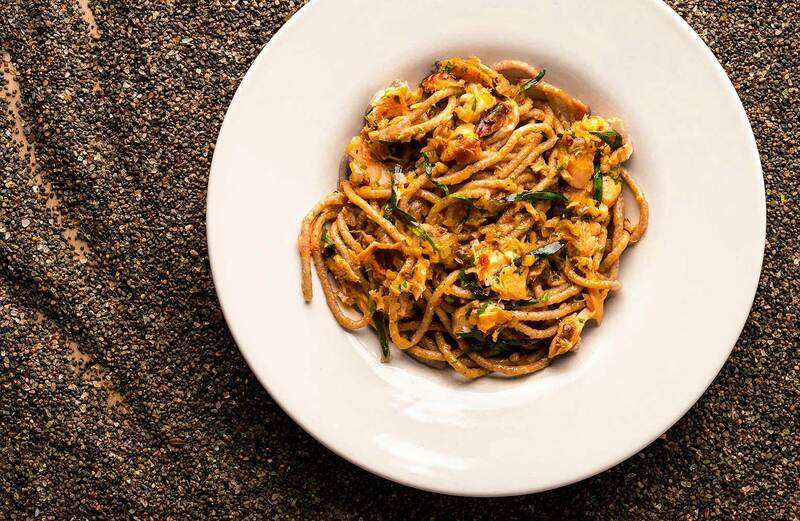 I’m sure this pasta is perfect as is… But I think when I make this next week, I’m going to throw in the massive amount of swiss chard I have growing in the garden. Tried this with smoked striper, it was AWSOME. That looks and sounds fabulous Hank! I have smoked salmon hubby made this last week and I love to make pasta. We will enjoy making this recipe and I bet it tastes fabulous! Enjoy your stay in beautiful Alaska! Really like your blog, books, emails, etc.